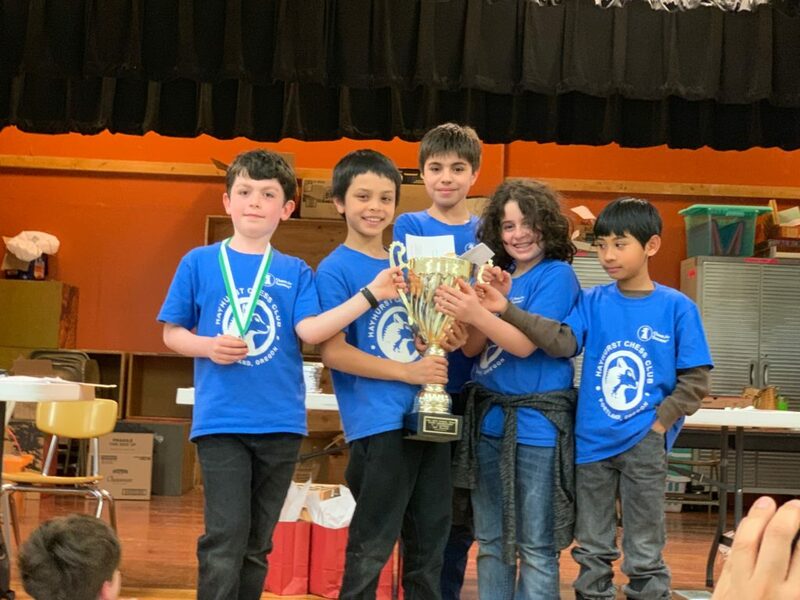 Hayhurst Chess Club showed up in force as organizers, volunteers, participants, and winners of the K5 Division at the 2019 OSCF K12 Team Championship. Our school sent 24 children to compete, joined by nearly as many parent volunteers who helped run the event. Thanks to PTA support and our own fundraising, we were able to support attendance with $575 worth of tournament scholarships to Hayhurst students and another $400 to students from other schools. Hayhurst A had its best tournament of the year, posting a near perfect score of 4.5/5, with the only draw coming in a head-to-head matchup against eventual Co-Champion Jacob Wismer. That matchup was highlighted by an incredible win by Charlie and a hard-fought draw by Jasper, both against much higher-rated opponents. With the team championship behind us, our attention is now on the OSCF individual state championship in Seaside on April 12-13. There are multiple divisions for all skill levels. Anyone interested in attending should contact Chad Lykins. For those who really want to see how far Hayhurst can go, Pace Lykins will be competing at the USCF National Elementary Championship in Nashville, Tennessee on May 10-12. Hayhurst students interested in making the trip to Nashville to compete as a team should contact Chad as soon as possible.